The strength you need for tooling and functional parts. Designed for accuracy and built to survive the production floor environment, the X3 3D printer saves you time and money. 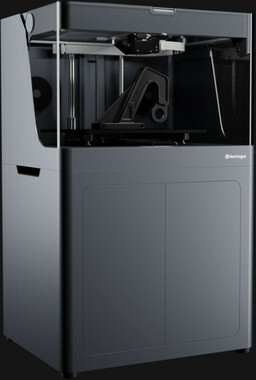 The Markforged X3 is a plastic 3D printer that uses chopped carbon fiber filament reinforcement to produce parts that are 20% stronger and 40% stiffer than ABS. Resistant to impact and a wide variety of manufacturing chemicals. These heavy-duty parts stand up to abuse. The X3 is designed to just work. Fully instrumented with motor encoders and a laser micrometer 3D scanner. Exceptionally accurate, consistently reliable, and repeatable. This cost-effective 3D plastic printer meets the needs of a huge range of industrial applications. Industrial grade performance starts with an all-aluminum unibody enclosure built around an ultra flat gantry system. Add a machined aluminum stage with kinematic bed coupling, and a precision ground print platform. Then close the loop with software — instrumenting each 3D printer with a full sensor suite including motor encoders and a calibration laser so accurate it can compensate for single digit changes in room temperature. 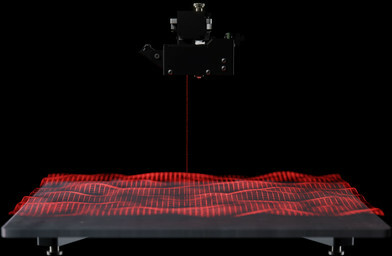 With a built-in laser micrometer, the X3 3D plastic printer automatically scans the print bed with 1µm accuracy to generate a contour map of its surface. By calibrating its measurements with extrusion readings to perfectly set nozzle height and active topography adjustment, the X3 ensures your prints come out exactly how you want them.